Arvel Plantation is a large plantation between Pelagiad and Suran. 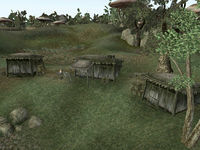 The plantation is the home of Hlaalu nobleman Rovone Arvel, and it is the source of his wealth and influence. Affairs appear to be going well judging by the amount of exquisite clothing on display by the nobles. Slaves work the fields, where one of the primary crops is corkbulb root. Since there is no key, there is no direct way to free these slaves. You can use the spell Command Humanoid on the slaves and lead them to a place where a key exists, then free them. Nearby Dren Plantation comes to mind. This page was last modified on 8 September 2018, at 03:44.